Golden Barrel Light Corn Syrup Blend - 1 Qt. Thicken and sweeten your patrons' favorite candies and baked goods with this Golden Barrel light corn syrup blend! Since 1934, Zook Molasses Company grew and expanded its expertise to become what is now Golden Barrel Baking Products. Committed to only serving guests the best quality, this corn syrup blend is sure to be a welcome addition in your restaurant or diner. It features a blend of corn syrup, fructose, vanilla, and salt. Corn syrup is liquefied sugar made from cornstarch that's available in both light and dark varieties. 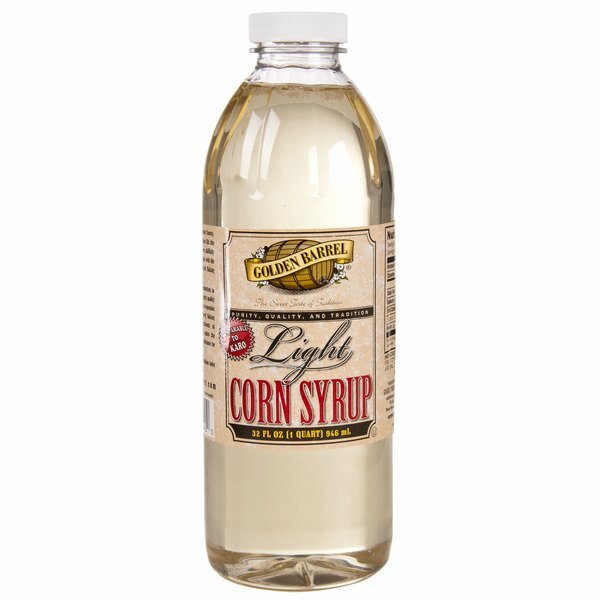 This thick-textured light corn syrup is light in color and includes a hint of vanilla for enhanced flavor. Your more health-conscious patrons can rest assured that this product does not contain fat, cholesterol, or preservatives! Besides its sweetening properties, corn syrup adds volume to baked goods, thickens sauces, and prevents crystallization of sugar. Since it retains moisture, it maintains a food's freshness. Use Golden Barrel corn syrup to make pies, candies, jams, jellies, fountain syrups, glazes, and marinades. It's an excellent multi-purpose bulk ingredient for any establishment! Domino 10X Confectioners Sugar - 50 lb. Overall User Rating: Golden Barrel Light Corn Syrup Blend - 1 Qt. The light corn syrup is very good product. I use the corn syrup for baking. The delivery was fast. I will order the product again. I love the Golden Barrel light corn syrup blend and its great for baking pecan pies . The syrup is a great quality and terrific price for the quart. This is a decent quality corn syrup. I use it in candy making as well as in some chocolate frostings. Not too thick, not to runny, just right! The golden barrel light corn syrup blend is a great alternative style of syrup that is great for our bakery. The blend is terrific and makes excellent baked items. Great tasting corn syrup at a great value, I use this to bake and I also mix it with vodka to use as a sheen on my fondant cakes. This was the first time i found a big container of light corn syrup. It saved space in my pantry and the price is great! I use corn syrup for marshmallow and candy making. I like having this size in my cupboard because it doesn't take up as much room as the gallon containers... it's so tall and narrow so it doesn't take up much room at all! The taste is good, I have no complaints. Value-wise, it does make sense to buy them in gallons and refill the smaller container though, if you're going to be using a lot of it. Even making a whole batch of marshmallows (that filled a 9"x13" pan) barely put a dent in this bottle though, so this size would probably be sufficient for most home cooking. Great price on Light corn syrup. I use a lot of it making lots of baked goods. The taste is great and hasnt failed me yet! what a great price! I was buying other brands in the grocery store for so long because I didn't know of this on here. You get like double the amount for half the price. Finally a corn syrup that pours easy with a messy result. Works and taste just the same but is much easier to work with, which is why I suggest buying this product. Great corn syrup for baking needs. This brand has a great price on it too, so you don't have to be afraid to use it all up. I use this corn syrup in my hand made fondant as well as in my candy clay and it works perfectly. It's a nice quality corn syrup! We routinely purchase Corn syrup, but never Golden Barrel. We generally purchase local, however, with ordering many other items through WebStaurant we wanted to give this a try given its great review. I can say for 1qt. it is relatively cheap AND uses the highest ingredients without preservatives. I only wish they sold in more bigger bulk sizes. Excellent product. We heavily use corn syrup for wet walnuts and a few other toppings / products in our store. Golden Barrel is a trusted brand and we are happy to see WS carry it. 1qt. can go a long way and is a must for any household or business. It is also sold in bigger quantities (its cheaper per ounce that way if you use a lot). I have chosen this "light" version of the syrup because I am so into my health lately, it doesn't taste too much different from the regular. I also like the vanilla flavor they have added. You can't make it too sweet for my sweet tooth! You are just going to love it if you haven't tried it before! Love it! Love it! Love it! I use it when I make fondant and gumpaste. It goes a long way. I recommend purchasing this. Bigger and cheaper than other brands. This light corn syrup is great for baking cookies. I used to create my own syrup by melting sugar in water, so this ready-version saves me a lot of time! This light corn syrup is perfect to use in my cookie icing which is a mixture of royal icing and glaze. This corn syrup doesn't discolor my icing and keeps it from drying rock hard. Great product, has worked well in ice cream making and pastry applications with no noticeable difference between this and the higher priced comparable grocery store options. Such a great value for this light corn syrup. It's great for making pies and candies. We've recently started making homemade lollipops and this works great! Such a great price for light corn syrup. I can get a gallon here for the price a quart costs in our local store! Great for holiday candy making!